When can we expect photos to be released? Belt object suggest it is approximately 20 miles long by 10 miles wide (32 by 16 km). May have to wait just a few more days or weeks Orin, at least for the really good stuff. I just read that NH is about to pass behind the Sun from our vantage, so there will be a short radio blackout of a few days in early January. 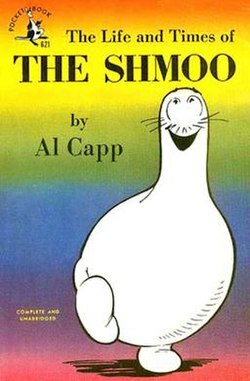 <<The shmoo (plural: shmoon, also shmoos) is a fictional cartoon creature created by Al Capp. The popular character has gone on to influence pop culture, language and even science. They are incredibly prolific, multiplying exponentially faster than rabbits. They also produce eggs (neatly packaged), milk (bottled, grade-A), and butter—no churning required. Their pelts make perfect bootleather or house timbers, depending on how thick one slices them. They have no bones, so there's absolutely no waste. Their eyes make the best suspender buttons, and their whiskers make perfect toothpicks. In short, they are simply the perfect ideal of a subsistence agricultural herd animal. Naturally gentle, they require minimal care, and are ideal playmates for young children. Some of the more tasty varieties of shmoo are more difficult to catch. Usually shmoo hunters, now a sport in some parts of the country, utilize a paper bag, flashlight and stick to capture their shmoos. At night the light stuns them, then they can be whacked in the head with the stick and put in the bag for frying up later on. In a sequence beginning in late August 1948, Li'l Abner discovers the shmoos when he ventures into the forbidden "Valley of the Shmoon" following the mysterious and musical sound they make (from which their name derives). There, against the frantic protestations of a naked, heavily bearded old man who shepherds the shmoos, Abner befriends the strange and charming creatures. "Shmoos", the old man warns, "is the greatest menace to hoomanity th' world has evah known!" "Thass becuz they is so bad, huh?" asks Li'l Abner. "No, stupid", answers the man—and then encapsulates one of life's profound paradoxes: "It's because they's so good!!". Having discovered their value ("Wif these around, nobody won't nevah havta work no more!! "), Abner leads the shmoos out of the valley—where they become a sensation in Dogpatch and, quickly, the rest of the world. Captains of industry such as J. Roaringham Fatback, the "Pork King", become alarmed as sales of nearly all products decline, and in a series of images reminiscent of the Wall Street Crash of 1929, the "Shmoo Crisis" unfolds. On Fatback's orders, a corrupt exterminator orders out "Shmooicide Squads" to wipe out the shmoos with a variety of firearms, which is depicted in a macabre and comically graphic sequence, with a tearful Li'l Abner misguidedly saluting the supposed "authority" of the extermination squads. Just read on space.com that this radio blackout period runs from Jan 4 to 9, so we might get some goodies soon Orin. 10Q BielDaniel! Hopeful for it! Alan Stearn wrote: It’s a snowman, not a bowling pin! <<So how does a separated binary become a contact binary? One thing that needs to happen, obviously, is that the two components have to get closer together. In physics terms, their orbit needs to destabilize. Nesvorný and coauthors say the orbit could destabilize in several ways. Small impacts on either object could cancel out some of their orbital energy, allowing them to draw closer to each other over time. If the binary orbit was significantly tilted with respect to the plane of its orbit around the Sun, a kind of orbital dynamic called Kozai cycles could draw them closer together. The team says that the two spheres likely joined as early as 99 percent of the way back to the formation of the solar system, colliding no faster than two cars in a fender-bender. 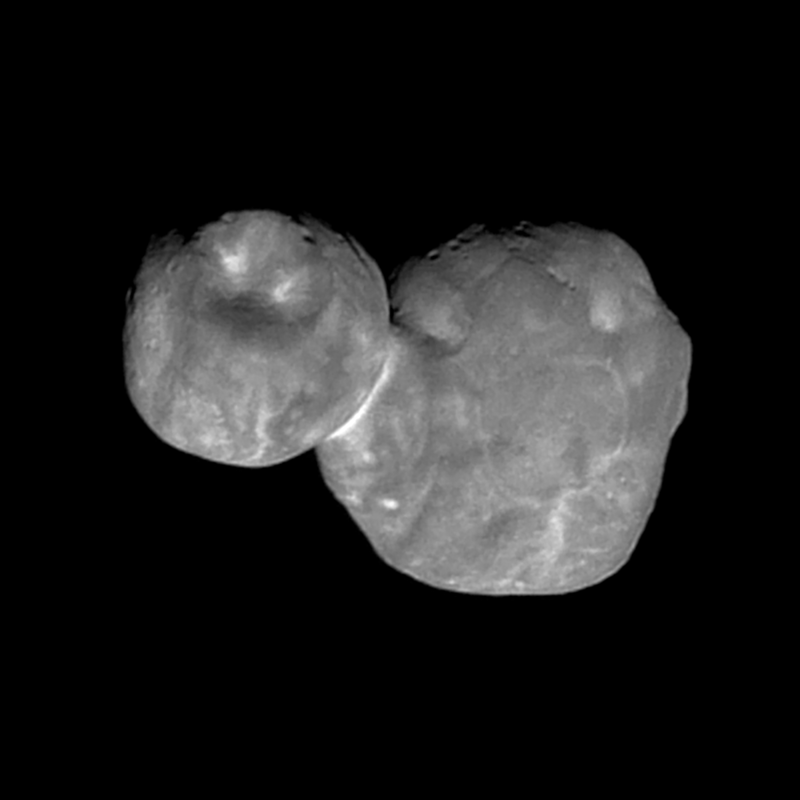 ..."
The two lobes of Ultima Thule — the first Kuiper Belt contact binary visited — are nearly identical in color. This matches what we know about binary systems which haven't come into contact with each other, but rather orbit around a shared point of gravity. Thanks; bystander! I watched PBS Nova yesterday and they showed how they came up with the size of Ultima Thule before even being able to see it! Was a very interesting show! I agree Art. A book I've been discouraged from quoting here had a similar thought, "You will know the truth, and the truth will set you free." Nice photo bystander; I hope a lot more come in soon! Strange is right Orin. I wonder how the two parts managed to settle into that somewhat odd configuration, considering that there must be several more gravitationally compact arrangement possibilities. Weird. It's almost as if when we rounded the far side of our Moon for the first time but we had found that it was flat instead of round on the backside. Now I'm hungry for walnut pancakes. Yum. IHOP should come up with a new menu item: the Ultima Thule frozen walnut pancake desert. "the polhode rolls on the herpolhode without slipping"
considering that there must be several more gravitationally compact arrangement possibilities. thereby allowing for a stable slow spin. Now I'm hungry for walnut pancakes. Yum. IHOP should come up with a new menu item: the Ultima Thule frozen walnut pancake desert. There is an Intergalactic House of Pancakes at the end of the Universe. 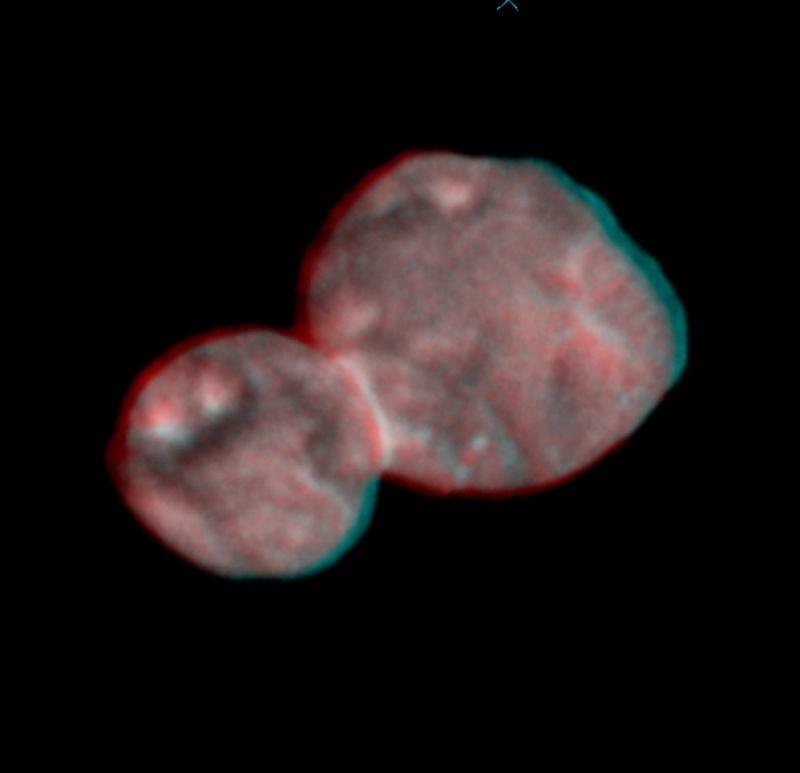 I have to agree that there must be other means of forming orange tholins than atmospheric processes, since Ultima Thule is reddish-brown. 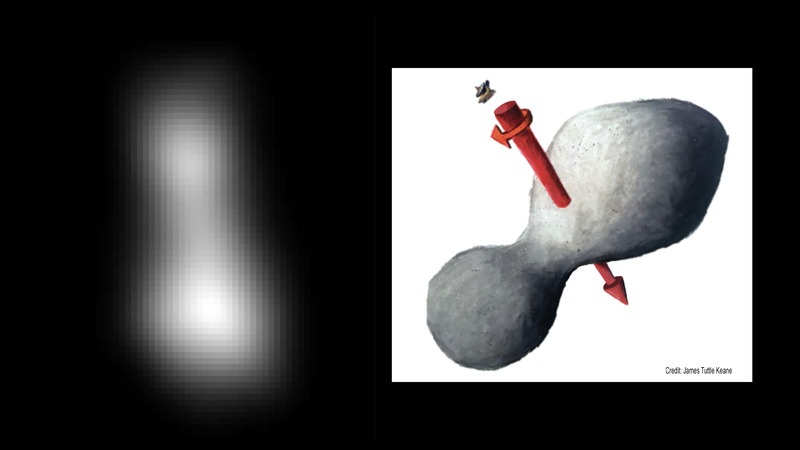 Perhaps the collision between Ultima and Thule released materials that coated both bodies with some material that later turned reddish-brown due to ultraviolet radiation from the Sun?